"In this loose-leaf work practitioners and other interested stakeholders will find a wealth of useful material which will be welcomed by anyone in this important and rapidly-developing area of competition law practice"
"The Digest provides an indispensable short-cut to the key legal considerations. Practitioners, academics and the enforcement community will no doubt turn to the Digest for the easiest route to the right answer in cartel cases." " This publication should not be on every practitioner's bookshelf -it should be open on every practitioner's desk!" 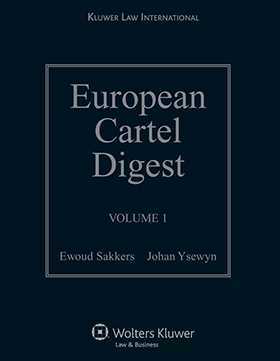 "The Digest provides an excellent summary and systematization of hard-core cartel cases in Europe. It will be a very useful tool, especially for practitioners."